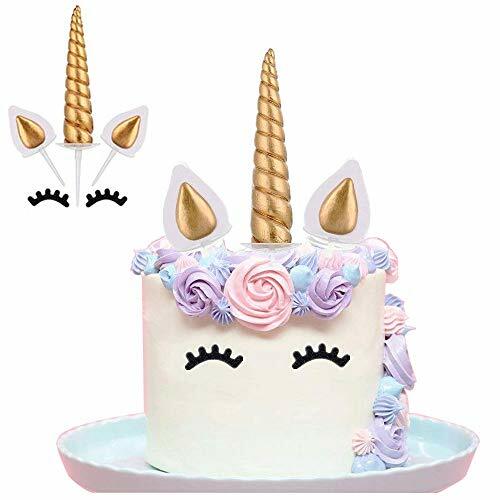 Cake topper kit includes: Unicorn horn, 2 ears and 2 eyelash, ideal for an 8 to 10 inch cake to celebrate a your child's Unicorn birthday! Length of the Unicorn horn is 4 inches, The ears are 2 inches in length, Length of eyelashes are Approx. Picks are mounted flush using clear adhesive and clear picks which makes your unicorn birthday cake topper look Seamless. The golden Unicorn horn and ears are made of soft clay, sturdy and non toxic, enable re-use. This adorable cake topper would look amazing at your next Unicorn theme party, majestically event, birthday party, or baby shower! Old Fashioned Gourmet Bakery Gift.